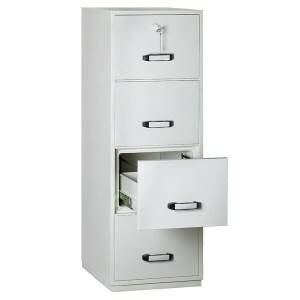 Our Range of Fire Filing Cabinets. 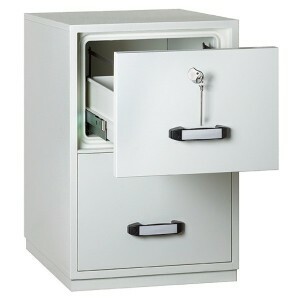 At Insafe we only supply quality fire resistant filing cabinets (fireproof filing cabinets). The top of the range cabinets are 2 hour fire tested for paper at 1,010°C and independently impact drop tested from 9 metres ensuring superb protection for your important documents. Key or electronic locking options available. 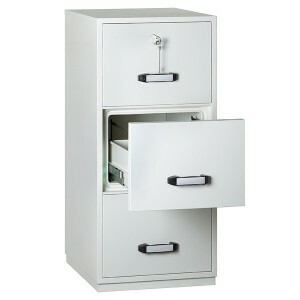 The body of our fire resistant filing cabinet has been designed for greater strength and rigidity. Produced using modern precision tooling with only prime quality galvanized steel the cabinet is double walled and reinforced to form a rigid integral body. Our fireproof filing cabinets offer unequalled resistance to heat from fires or hot gases. A special construction prevents the passage of flames and hot gases to the interior of the drawer. Further still, each drawer has an independent five-sided enclosure heavily insulated with a fire resisting compound. The cabinets have been successfully tested at the prestigious Underwriters Laboratories Ltd, USA for ratings of Fire Endurance, Fire and Impact as well as Explosion Hazard as per UL : 72 Class 350. The 2-hour fire-impact test involved heating the cabinet, in a specially designed furnace to almost 1010°C (1850°F), dropping it from a height of 9 meters and subsequently heating it again in an inverted position to 1010°C (1850°F). After testing the papers inside were still usable. Each drawer is built with a self-closing latch which enables users to shut the drawers almost instantaneously during emergencies. A sturdy automatic locking mechanism is controlled by a high-precision 6-lever dual control lock, which serves all the drawers.